This early Ayckbourn is something of an enigma. The setting may be unreservedly 1970s but the subject of sexual relations is timeless. In the 21st century this play should no longer work but it does. 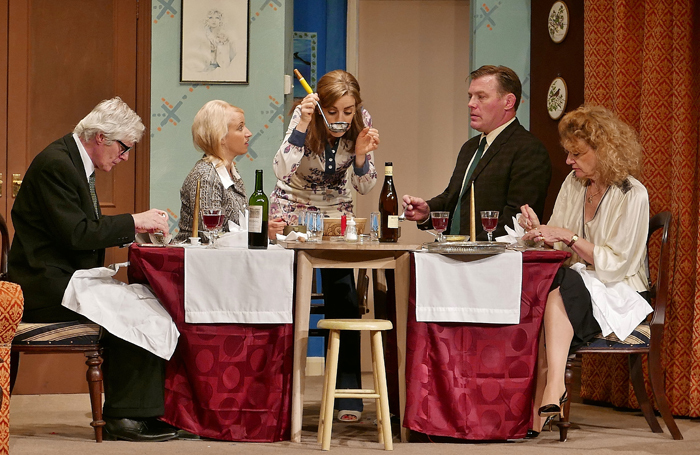 Suffolk Summer Theatres, which started life in 1980 as the Jill Freud Company, has opened its 35th season with this farcical classic of marital manners. Directed by David Harris, the cast display a satisfyingly light touch. Nothing is laboured and there are no knowing winks to the audience about 1970s attitudes to marriage. Even the fashions and the furniture are not overdone. Veteran designer Maurice Rubens, celebrating 25 years with the company, keeps everything clever and correct with his two-rooms-in-one approach. The couples’ homes occupy the same space on stage and they have split tables and sofas. The decoration is suitably restrained. The tone from Harris and Rubens is that this is a tale about real people. It would be so easy to turn the 1970s setting into a parody but the production team neatly sidesteps this. Harris, recognising the wit and observation contained in Ayckbourn’s words, has no desire to turn this into an ironic homage to 1970s bad taste by making it a modern-day copy of The Confessions films. The casting is spot on. Michael Shaw generated huge laughs as the absent-minded Frank Foster while Kate Middleton made her stay-at-home mum Teresa Phillips believably real as she slowly became aware of her husband’s philandering. A fresh approach provides a crowd-pleasing start to a new season.